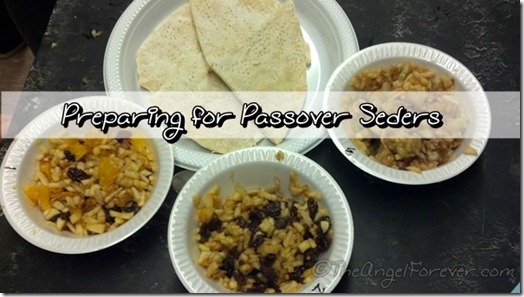 During a recent Hebrew School session, the kindergarten kiddo and I had the opportunity to participate in some Passover workshops. One of the sessions was about Charoset recipes from around the world. During the time, we would make out own matzoh within 18 minutes and then make and taste three different types of Charoset. I wish I had more photos to share, but most of the time my hands were in the matzoh dough or helping JSL mix the different Charoset ingredients together. If you are not familiar with traditional Passover foods, Charoset is a paste made from fruits, grape juice or wine, and spices. They remind us of the mortar that the Israelites used to make bricks while they were slaves in Egypt. 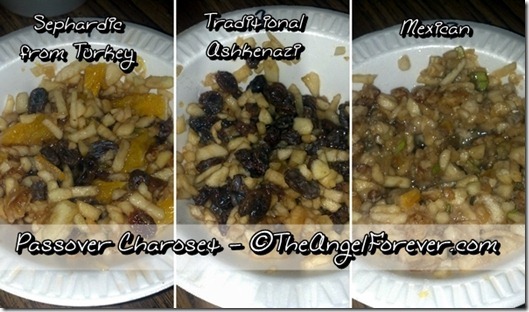 Growing up the Charoset that I was used to included apples, walnuts, wine, honey, sugar, and cinnamon. I adored this and would often ask for extra because it was so delicious. During Hebrew School, the recipes were nut-free to comply with a nut-free program. This was good for me since I am allergic to walnuts now. After our matzoh was in the oven, it was time to mix together all of our Charoset. First we made the Sephardic one that is from Turkey. It had raisins, orange, apples, dates, and grape juice. 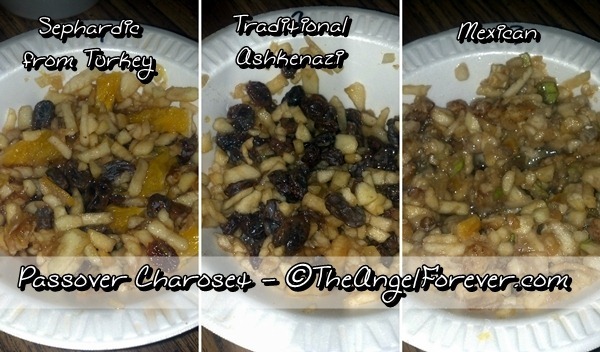 The next one was a traditional Ashkenazi Charoset from Eastern Europe. This had red apples, grape juice, honey, raisins, and cinnamon. The last one that we had time for was a Mexican Charoset recipe. This had pear, apples, bananas, dates, cinnamon, and grape juice. Since it was late, we packed everything up to share with NHL and TechyDad later on. We had a taste testing party and to my surprise everyone loved the Mexican Charoset. Even my picky eater who helped to make it asked for more. NHL, TechyDad and I also liked the citrus kick with the Sephardic Charoset. The most traditional one was just that, something we were used to from all of our Seders. 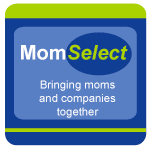 Do you have a special Charoset recipe that you make for your family? I would love to know and if you are interested in any of the recipes that we made, just let me know. @Devo – Agree almonds would be great with the oranges in the Sephardi version. I know walnuts are traditional in the Ashkenazi one (I’m now allergic to walnuts and this makes our Charoset so different). Trying to think about what would go well with the bananas. I wonder if peanuts to add a little salty taste. A sweet nut may be too much with the pears, apples, dates, and bananas. 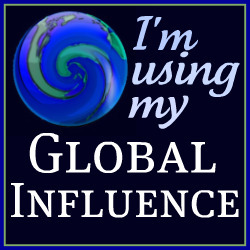 Will think about this and keep me posted on what you decide to do. This was great. I was just thinking that I wanted to try some new Charoset recipes this year. We will have to give a few a try too. I also have to make some for my daughter’s pre-k class. I’ll have to find out if they want to do a tasting too. Thanks again. Hope your Passover prep is going well. I am now going a little nuts trying to figure it all out. I’ve only flipped the house once before and now it’s a new house with 2 kids I didn’t have before.